With Gabriel Resources seeking US$4.4 billion in damages, Alburnus Maior, a prospective amicus curiae in the arbitration case, announces that it aims to file its brief to the ICSID Tribunal until September 2018 at the latest. It will detail compelling concerns and information overlooked by the parties to the case. Rosia Montana Gold Corporation (RMGC) is 80% owned by Gabriel’ Resources (TSX:GBU). Romania’s government owns the remainder. To realize Europe’s largest gold mine both planned to uproot Rosia Montana’s population. From the outset their venture was beleaguered by corruption, operational problems and vehement opposition. From 2007 on, their proposal was blocked by court sentences secured by Romanian NGOs and Alburnus Maior, an association of property owners from Rosia Montana. Hence in 2013 the government aimed to push through a bill fast-tracking the mine in the national interest. 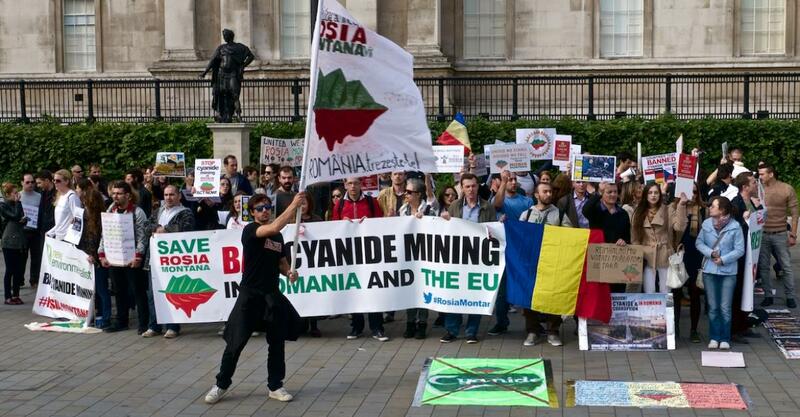 This highly irregular move as well as Gabriel Resources threat to seek damages if the mine was not approved, drew hundreds of thousands into the streets in Romania and beyond until the government backed down several months later. Shortly after the inception of the arbitration or ISDS case in 2015 Alburnus Maior, Greenpeace Romania and the Independent Centre for the Development of Environmental Resources (ICDER) contacted the ICSID Tribunal via its team of lawyers to request access to information as prospective amici curiae. The Tribunal replied by releasing several documents; including a timeline allowing the NGOs to submit their brief until September 2018. The decision on whether to admit the amici lies with the Tribunal and is likely to occur after the submission of the brief. “There exists a Romanian proverb along the lines of: stupid is not the one asking, stupid is the one giving. Gabriel can always ask but if really determined, then the government has all the arguments to successfully defend Romania. After today’s confirmation of Gabriel seeking US$4.4 billion in damages, this case is an issue for the country as a whole. It is taxpayers money that would pay for the damages. Together we need to make sure that the government is determined to win, because right now it doesn’t look like it at all,” says Eugen David, president of Alburnus Maior. “In a few days time we will launch a dedicated section at www.rosiamontana.org to provide information, updates and action alerts. We hope people will register and act as there is plenty we can do now to pressure the government to set the case and its role with the goal to win. We did it before and we can do it again,” says Roxana Roxana Pencea Bradatan from the Save Rosia Montana! campaign.